Miranda Elish picked up her tenth win of the season, blanking the Montana Grizzlies 7-0 in Sunday’s opening game of the Oregon Invitational Tournament at Jane Sanders field. In keeping her record perfect, Elish allowed a single base hit and one walk while striking out 11 Grizzlies to pick up the complete game victory. The Ducks opened the scoring with a pair of runs in the third inning thanks to Shannon Rhodes’ single up the middle. Rhodes drove home two more in a five-run fifth to put the game away. Mia Camuson, Alexis Mack and Haley Cruse each contributed a pair of base hits. The bats came out in force for the tournaments’ closing game against Bryant. After plating a run in the opening inning, the Ducks sent 14 batters to plate in a 13-run bottom of the second. A three-run blast by Cherish Burks started the parade and by the time the wreckage stopped Oregon had given starting pitcher Maggie Balint a 14-0 cushion to work with. 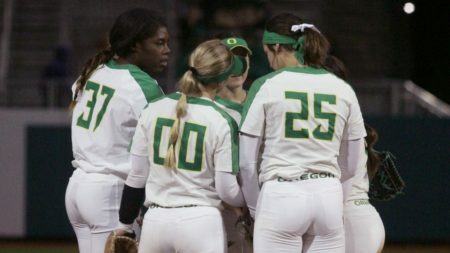 Oregon added a run in the third on April Utechts’ pinch-hit home run. The Bulldogs pushed across an unearned run in the fourth, but that would be it. Oregon added two more in the the bottom half on Elish’s pinch-hit two-run home run. Balint struck out eight and walked none to improve her season record to 6-1. With the two victories the Ducks conclude the tournament portion of their schedule until the NCAA’s in May and will open Pac-12 conference play hosting perennial powerhouse and rival UCLA beginning Friday at 5:00 pm. Game two on Saturday is set for a 7:00 pm start with the series concluding on Sunday at 2:00 pm. All three games will be televised on the Pac-12 Networks. The post Elish, Balint Team Up To Cap Ducks’ Perfect Weekend appeared first on DuckNews.com.